"The idea was to connect the small VAP11G portable WiFi bridge device (available on eBay and Amazon) to the D4's Ethernet port in order to use it through WiFi. I setup the Ethernet connection of the D4 and then used the VAP11G device to connect through my WiFi. I then used my laptop and iPhone to check the WiFi connectivity with the D4. It worked like a charm! The limitation of the device is that it didn't act as an access point - it would always need an established WiFi network, but the important thing was to prove that the price of the WT-5 price is ridiculously high ($877) and the VAP11G does the same thing for around $30. This limitation could probably be eliminated with the Asus WL-330gE wireless access point." 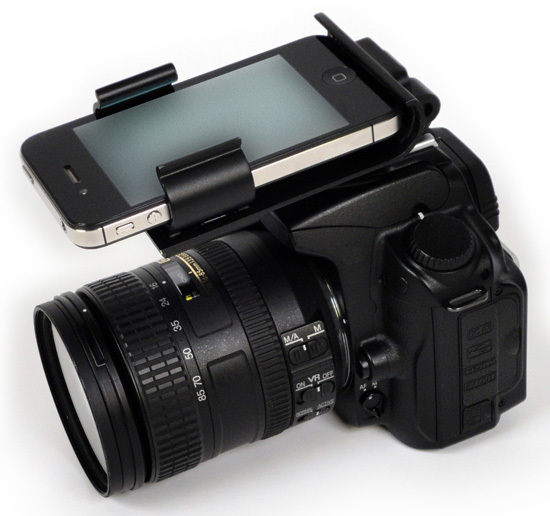 Sharing pictures: Imagine a DSLR with a 3G/4G connection: Bruno Rousseau says: "What if we could share a High Quality picture by E-mail, SMS or via cloud services like iCloud or DropBox? That is something users have done for years with their camera phone but never did with their DSLR. How does the Flash-Dock help doing that? Well, have you heard about the EyeFi SD Cards? EyeFi cards are SD Cards that store pictures and send them to the SmartPhone through their built-in WIFI chip. Again, it is possible to use EyeFi cards without the Flash-Dock, but it is not that easy. The SmartPhone being next to the DSLR, everything works seamlessly and without the user paying any special attention to it. Once the photo-shoot is finished, the photographer only has to share his photos with the world through the 3G/4G networks... they are all on his SmartPhone." 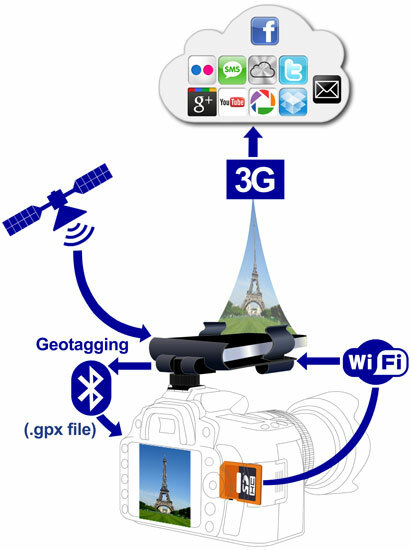 Geotagging with .GPX files: SmartPhones have a built-in GPS and most DSLR don't. SmartPhones can record tracks into a file called a "GPX file". 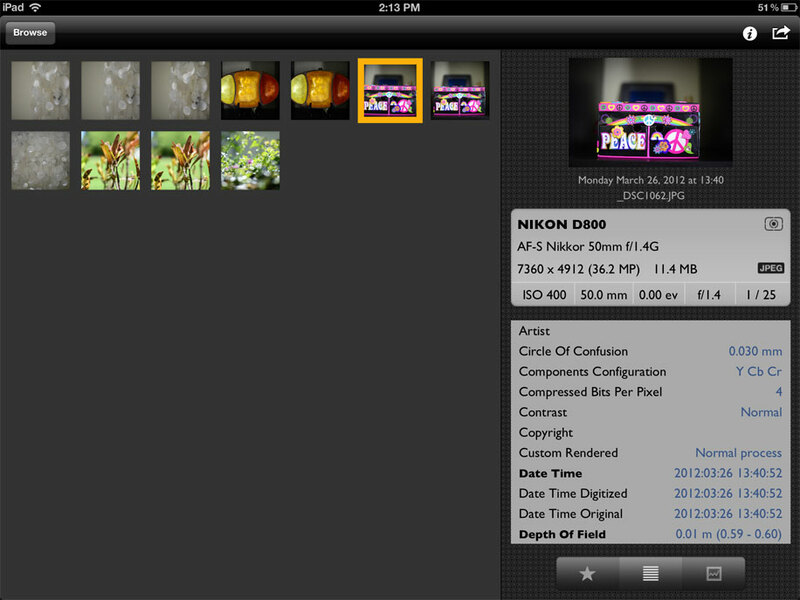 That file is then read by iPhoto, Aperture, Lightroom, Photoshop Elements, Picasa and most photo library softwares. What these softwares do is, merge this GPS data with the metadata of pictures taken during the photo-shoot. It is simple and free. 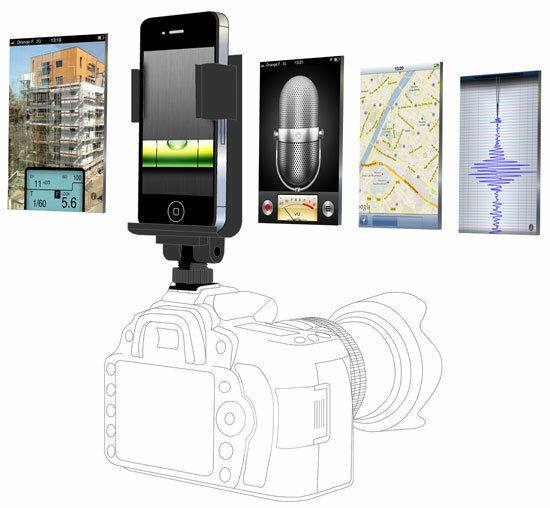 Geotagging with bluetooth: Some add-on devices like the BlueSLR are plugged into the DSLR GPS connector. Since SmartPhones also have a bluetooth connection, they can send in real-time location information to the camera that in turn will geotag pictures. It works the same way as if there was a GPS receiver plugged into the DSLR, only cheaper. LightMeter: SmartPhones have cameras and light sensors. 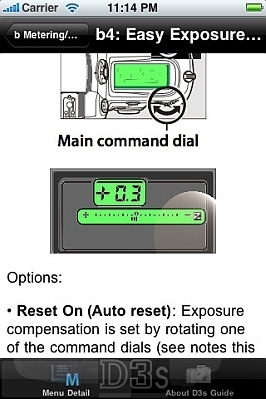 Both combined, some smart developers have managed to create Light Meters that perform very well. They do require a calibration with a real light meter, but passed this stage, all the photographer needs is a SmartPhone. 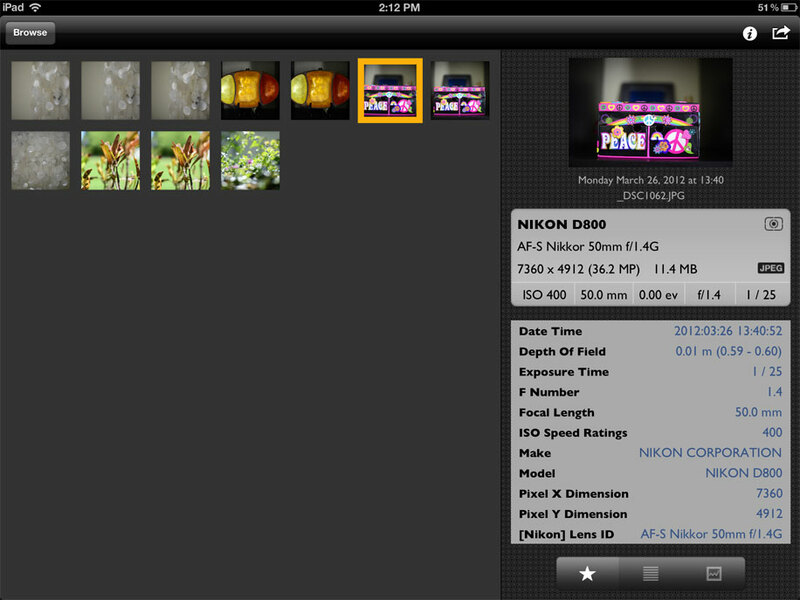 Depth Of Field calculator: These apps let the DSLR user calculate precisely the sharp area before and after the subject. These calculators take into account the lens type, the camera model and aperture to give a very precise value. Level: Photographers have used levels for years on their tripods and now some DSLR feature an electronic horizontal line. 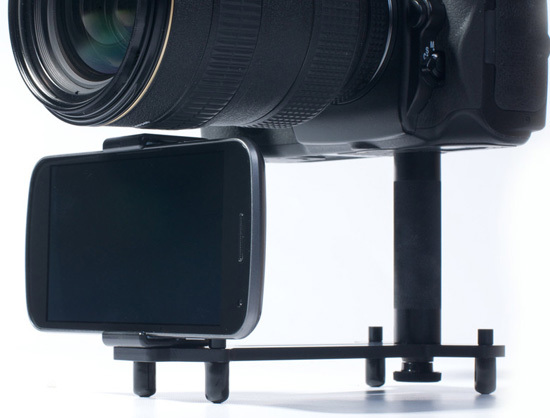 However, some cameras do not have this feature and people can now monitor a level even without a tripod. Typical accelerometers inside the SmartPhones have an accuracy of 0.1°, more than enough for a level functionality. Microphone: The latest DSLRs all have video functionalities. However, the sound is often not in par with the video quality. SmartPhones on the other hand are made to deliver good sound quality with ambient noise cancellation and remote recording. Another good exemple of combining DSLR and SmartPhones. Vibrations monitoring: What sort of vibrations does the shutter bring on a DSLR? 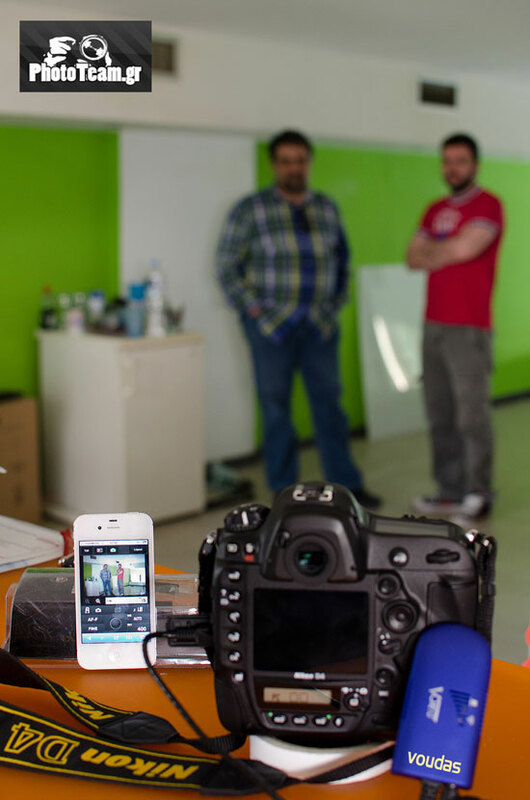 With Seismometers apps, photographers can visually see and record the vibrations brought by their set up and correct it until pictures are taken completely still.